Dieses geräumige (2400 Quadratfuß) mit drei Schlafzimmern, zwei Bädern, hat Waterfront Hause einen Panoramablick über den Hauptteil des Sees. Das Haus liegt so nahe am Wasser können Sie die Fische springen hören! Es gibt zwei große Wrap-around-Decks w / adirondack Stühlen und Blick auf den See. Private überdachte Bootsanlegestelle, (sehr tiefem Wasser! )zum Baden und Angeln rechts aus dem Dock, nur wenige Schritte! vom Haus entfernt. Lake Lanier Water Park nur wenige Minuten entfernt sowie mehrere Golfplätze Waterfront. Boot und Jet-Ski-Verleih, sowie geführte Angeltouren zur Verfügung. Sorry, No Smoking! Keine Haustiere! Fisherman weiß getünchten Kiefern Wände, gewölbte Decken mit sichtbaren Balken, Wände von Fenstern! zwei steinernen Kaminen machen dies der perfekte Ort. Eine große große Zimmer mit Kathedrale Decken, einem Stein ua mit Kamin und die Wände von Fenstern über den gesamten Raum mit Blick auf den See! dass öffnet sich zu einem Wrap-around-Deck, die mit Blick für Meilen zu einem offen ganzjährig Blick auf den See, Adirondack Liegen, Terrasse Tische und Sonnenschirme (entspannen und die Segel!). Voll ausgestattete Küche mit Schieferboden und Essbereich, die den Blick auf den See, beinhaltet Kaffeemaschine, Mikrowelle, Toaster, Mixer usw. Deck zugänglich auch durch Küche. Das geräumige Schlafzimmer hat ein Queen-Size-Bett, ein komplettes Bad gefliest mit Doppelwaschtisch. Alle Bettwäsche, Seife usw. sind vorhanden. Ein großer Wohnbereich mit mexikanischen Fliesenboden und Stein Kaminofen Kamin. Satelliten (2) TV / DVD / VCR, zwei Schlafzimmer, jedes mit einem Queen-Size-Bett, zwei Queen-Size-Schlafsofas, plus zwei Zusatzbetten, voll gefliesten Bad und zusätzlicher Außendusche, Waschmaschine / Trockner und eine Garage für zwei Autos Zehn bequem schlafen können. Atemberaubende Aussichten! Wände aus Glas! von dieser unteren Ebene, die sich in einen anderen Wrap-around-Deck, eine übergroße Schaukel, wo man sitzen und den Sonnenuntergang zu beobachten oder Sterne-Blick können führt. Steps (50 ft) zu tiefem Wasser und überdachte Dock w / Schwimmen-Leiter. Im Herbst und Winter können Sie sehen, eine Deer Mäander durch. Das Haus liegt zwischen den schönen Hartriegel und Laubbäumen, Rhododendren und Azaleen. Nur wenige Minuten von den öffentlichen Bootsrampe und Marina, 45 Minuten von Atlanta. Haustiere sind nicht erlaubt! Rauchen verboten! Yes, this is a house with a "Million Dollar View" and much more! We have rented this lake house 4 different times for summer family fun. The split plan -- upstairs living area/kitchen/bedroom and downstairs living area/bedrooms -- allows for plenty of family quiet time yet living areas are large enough for everyone to gather together for family fun. The owner has been very friendly and works with us on scheduling arrival and departure. Can't wait for July 2019 to be sitting on the deck of the 'house with a million dollar view' looking out at Lake Lanier. We stayed for a wonderful week with our 5 grandchildren. They had a blast fishing and swimming from the dock. We didn’t worry about any boats interfering with the fun as the house is located on a beautiful cove. The two level house really worked out as the older kids played video games downstairs while the younger ones watch TV upstairs . We will be back !! So sad to leave paradise on the Lake! We initially rented this beautiful home for a family vacation, and gave rave reviews at the time of our stay. We approached the Owner when we were assigned to an 18 month project in Alpharetta. We loved the home so much we requested to rent long term. Anne was gracious enough to accept our offer. We have spent a glorious year and a half renting this home. So many beautiful family memories have been made. The view is spectacular to say the least. We have enjoyed coffee on the deck and dock. Swimming and boating in the deep, clear water. Our entire family of 9 can sleep comfortably, and they have visited often! There are two beautiful fireplaces that make things very cozy in the winter. The grill is fantastic, and the home is well appointed with anything you may need. Anne has been very responsive to anything we needed. She was great about checking on us to make sure everything was in proper working order. We are so sad to leave, but will be asking to rent this home for future family vacations on the Lake if it's available. Anne has become like family to us and we cannot recommend this home enough. 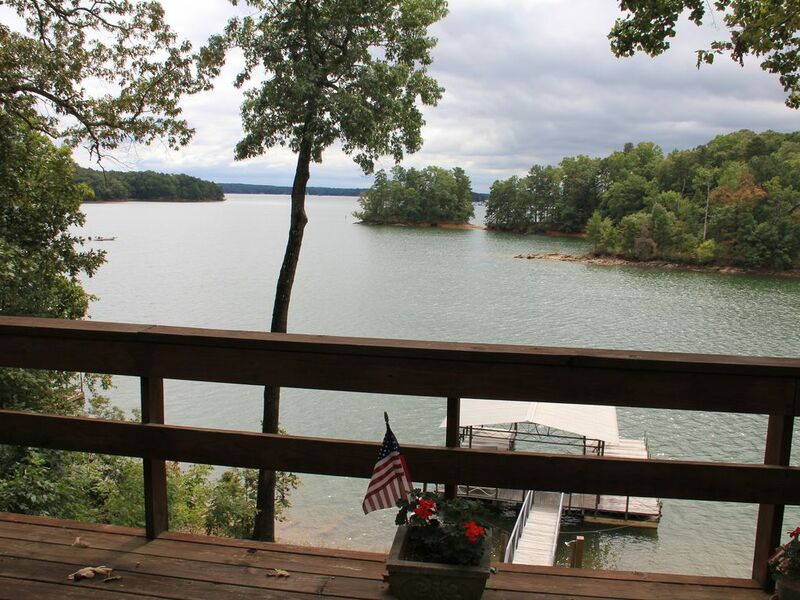 A fabulous vacation home on the best part of Lake Lanier with beautiful, clear water. This house is supplied with everything you need, except for groceries and Publix is very close by. Fresh clean sheets, extra blankets and pillows, a fantastic grill, and everything you need to cook for a large or small group. Fuel dock very close by. This home has two living areas which was perfect for our older kids who wanted to stay up late. We slept 9 very comfortably. My husband was able to commute back to mid-town during the week. We typically rent homes from large property management companies, so we appreciated working with Anne. She is so helpful and was genuinely concerned that everything was just perfect for our family vacation. We hope to be back soon! I spent a month at this fabulous house on the lake. The location was perfect and very close to atlanta! My kids loved the house and the cove was perfect for swimming. I would go back in a heartbeat. We had perfect weather and a perfect week. Brought our boat and enjoyed the dock being so close. A little late getting this written, life is busy. But we will go back again, especially if we can continue to bring our boat. NO PETS NO SMOKE (inside) HOLIDAY RATES: EXTRA Damage Deposit: Subject to Change! Holiday rates are extra.